Editor's note: This story was originally published at the start of the Republican National Convention in July. As Donald Trump has been inaugurated as the 45th president of the United States, it is worth taking a look at where you should be investing when he arrives at the White House. Also, check out what Donald Trump's policies would mean for the U.S. economy. 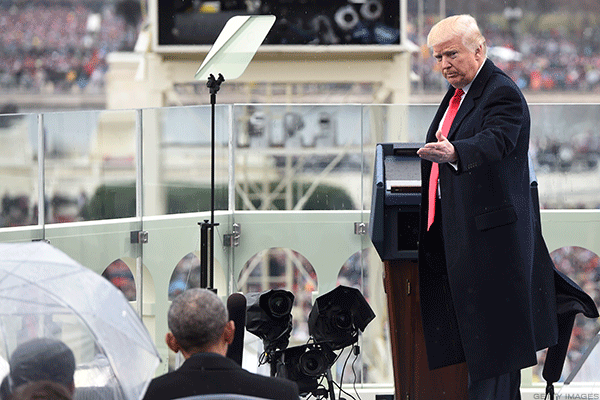 Donald Trump's election to the presidency has been cause for optimism among investors, with Wall Street enjoying what has been coined the "Trump rally" since November. It's not yet clear how broader markets will react to Trump once he's in the Oval Office, but there are certain companies that stand to do quite well under some of his policy proposals. 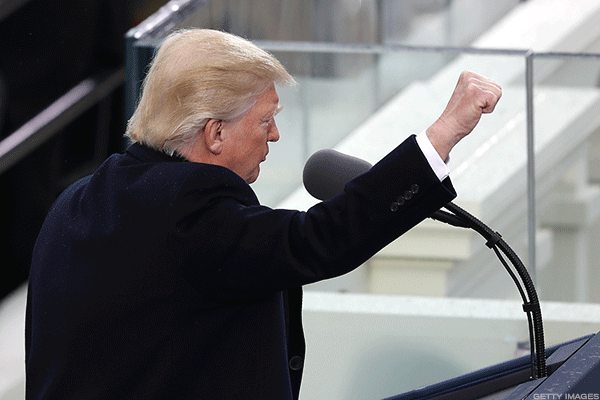 Here's a portfolio of 15 stocks experts think should do well with the real estate magnate in the White House, based largely on his stated policies and proposals on the campaign trail. Geo is a real estate investment trust that owns and operates private prisons; it has more than 100 facilities in the U.S. and abroad. Trump's election and his subsequent nomination of Senator Jeff Sessions as Attorney General have been a boon for private prison stocks, including Geo, and shares have rallied significantly. Trump's plans to up immigration enforcement will almost certainly benefit Geo, which already has a relationship with U.S. Immigration and Customs Enforcement. (ICE accounted for 17.7% of its revenues in 2015.) Trump has expressed support for private prisons in the past, and Sessions is likely to reverse course on a Justice Department memo instructing the Bureau of Prisons to phase out the use of such facilities. Geo donated $125,000 to a pro-Trump super PAC during the presidential campaign. Cemex is a materials company that specializes in cement and concrete. Its products would come in handy for Trump's plans for the U.S.-Mexico border, where he has pledged to build a wall stretching at least 1,000 miles. Trump has pledged to force Mexico to pay for the wall -- eventually -- but now says the U.S. government will foot the bill first. Trump has on numerous occasions on the campaign trail said a key part of his plans to defeat ISIS is by taking its wealth -- specifically, its oil. And he knows exactly who he would give it to. "Take back the oil. Once you go over and take back that oil, they have nothing. You bomb the hell out of them, and then you encircle it, and then you go in. And you let [Exxon Mobil] go in," he told conservative pundit Bill O'Reilly last year. Trump nominated Exxon CEO Rex Tillerson as Secretary of State. Trump has largely held that his border wall will be a real wall, made of concrete, rebar and steel, but recently, Trump supporter and former Texas Governor Rick Perry suggested that wall may be "virtual" instead. Elbit Systems has already been enlisted to build a virtual wall at the Arizona border, in 2014 winning a $145 million contract from the Department of Homeland Security. Perry has been nominated as Energy Secretary. Trump targeted Boeing soon after his election and the cost of its work on the presidential Air Force One plane. "Cancel order!" he wrote in a tweet. He and the aircraft giant have since made nice -- CEO Dennis Muilenberg said on Tuesday after a meeting with Trump that the pair have "made progress" on striking a deal. Boeing might be enlisted for Trump's border wall, too. Before Elbit Systems was enlisted to build a virtual fence at the Mexican border with Arizona, Boeing was contracted for a similar virtual project in 2006. The project, known as SBI-Net, was cancelled in 2011 after $1 billion were already spent. Should Trump become president and his wall end up being more virtual than it is real, Boeing could get a second go. The Bethesda, Maryland-based firm was the U.S. government's biggest single contractor in 2015, garnering $36.2 billion in contracts from various agencies, including Defense, Homeland Security and Navy. Trump has pledged to build up the U.S. military and defense spending, which would likely be a boon to Lockheed and other heavy-equipment defense companies. Like Boeing, Lockheed got caught in Trump's Twitter crosshairs after the election regarding the pricing of its F-35 fighter jet. CEO Marillyn Hewson has told Trump she will make a "personal commitment" to cutting costs. Lockheed has also sought to smooth things over by promising to add 1,800 jobs in the U.S. The Falls Church, Virginia-based company, like Lockheed Martin, would likely benefit under a Trump administration that is military spending-heavy. Northrop Grumman is the third-largest maker of military arms and equipment, with $24 billion in revenues in 2015. Like a number of technology companies, Microsoft holds an enormous amount of money abroad it won't bring back because of U.S. tax rates. If Trump is elected, that may change, much to Microsoft's benefit. The tech giant would save $28.1 billion on its tax bill if Trump is able to enact the 10% repatriation holiday he promised while campaigning, according to a recent analysis from the Institute on Taxation and Economic Policy (ITEP). Microsoft CEO Satya Nadella attended Trump's tech roundtable in New York in December, and Chris Liddell, former chief financial officer at Microsoft, will serve as assistant to the president and director of strategic initiatives in the Trump administration. Oracle will save $9.5 billion on its tax bill under Trump's tax holiday, according to ITEP. Its CEO, Safra Catz, attended Trump's tech roundtable and joined the executive committee of Trump's presidential transition team in December. Catz in January penned an op-ed in support of Steven Mnuchin, Trump's nominee for Treasury Secretary, and specifically cited tax reform. In April 2016, U.S. Steel filed a complaint with the International Trade Commission alleging Chinese steel producers conspired to fix prices, steal intellectual property and falsify import labels to avoid tariffs. S&P Capital argues Trump, who made trade reform with China a major plank of his platform, would help to expand revenues and profits in the industry with his efforts to penalize Chinese imports. Steel Dynamics is a steel producing and metal recycling company based in Fort Wayne, Indiana. It and other mini-mill (secondary) steel producers would also see a boost from a tough-on-China Trump. Tetra Tech is a provider of environmental engineering and consulting services headquartered in Pasadena, Calif. The company has been contracted to work on border fencing projects by the U.S. Army Corps of Engineers in the past, working on a barrier near San Diego. It might be in the running to continue work. Randgold Resources is a gold mining company based in Saint Helier, Jersey, one of the U.K.'s Channel Islands. In the White House, Trump might inject a significant amount of uncertainty and volatility into the markets. In such an event, investors may begin flocking to gold and related entities for stability. The Bitcoin Investment Trust is a publicly-traded vehicle that invests in and derives value from Bitcoin. Should investors go looking for new opportunities in the event a Trump presidency increases market volatility, virtual currency like Bitcoin could gain steam. The Brexit vote and uncertainties surrounding China have driven such surges in the past, and Juniper Research recently predicted a similar spike could be on the horizon should Trump be elected. Moreover, if Trump shuts down remittances with Mexico -- something he's said he would do in order to force the country to pay for his border wall -- those needing to transfer money across the border could go the Bitcoin route to get around it.